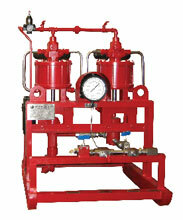 Windlass manufactures High Pressure Test Units from 5,000 to 30,000 PSI working pressure. These units can be used on site for hydrostatic testing of any product including BOP stacks, kill & choke lines and wellheads. All High Pressure Test Units are equipped with a nameplate specifying the model number. This number contains the mounting arrangement, maximum pressure rating, type of pressure readout and series identification. 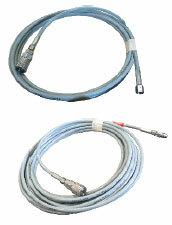 These Test Units provide versatile service in all static, high pressure testing applications. Equipment can be safely tested up to 30,000 PSI with its compact easy to operate design. 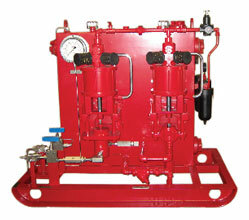 They include high pressure air operated pumps, valves and fittings to ensure trouble-free operation. They also include all necessary controls and safety devices as well as connections for the air and fluid supply lines. This style of Test Unit offers the convenience of being incorporated into the air operated pump assembly of the BOP control system. These units utilize the discharge of one of the BOP control systems pumps as the supply to the high pressure pump. The suction line is modified to include a supply connection for testing.